Roku is pushing out an update for current-generation Roku LT, Roku HD, and Roku 2 boxes that will bring a new cross-app search capability. Roku Search isn’t quite universal search as it is limited to Hulu Plus, Netflix, Amazon Instant Video, HBO GO, VUDU and Crackle, but it will allow users to search for movies, TV shows, actors, and directors across the supported channels. Select the Roku Search channel, run a search, and Roku will display a list of the channels that offer content that match the search term for the user to select from. Text can be inputted with an on-screen keyboard or via the soft keyboard on a remote control app. Given the breadth of content that Roku now offers, cross-app search is arguably a bit overdue. There are some notable Roku channels absent from Roku Search, such as EPIX and CrunchyRoll, so it seems a safe bet that Roku Search will continue to expand its reach. It will also be interesting to see if Roku can expand the functionality to IPTV channels such as DISHWorld. Roku Search makes it a snap to find movies, TV shows, actors and directors across Netflix, Amazon Instant Video, Hulu Plus, Crackle, VUDU and HBO GO. 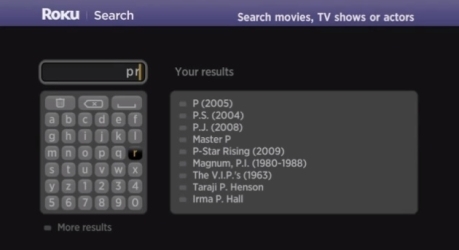 When you search for a title, Roku Search shows you where it’s available on the Roku platform. Simply select a channel and Roku Search will take you straight to your desired movie or show.